Chelo Manchego is an artist and meditation practitioner who grew up in El Salvador and now lives in Los Angeles, California. He is the author of The Want Monsters and How They Stopped Ruling My World and Little Royal: A Fish Tale. 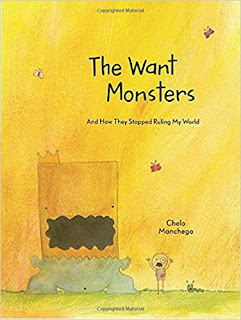 The Want Monsters features a greedy critter named Oskar who’s never satisfied because he always wants more. If he has one ice cream cone he craves the whole box, and he keeps playing video games until his thumbs hurt. Did you have a ginormous Want Monster as a kid? How did you learn to become more moderate? Oh goodness, yes, my want monsters were colossal. My poor parents! I am the baby of the family and I’ve always had a very driven personality, if not somewhat obsessive, so that made it difficult for me to take no for an answer, even from myself. 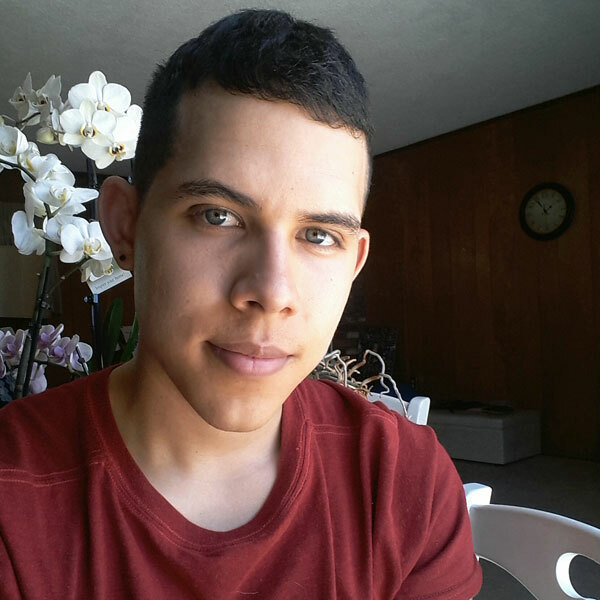 I moved to Los Angeles from El Salvador by myself. I was eighteen years old, and I had all this freedom, and the city was new to me and exciting and wild. If I wanted to eat an entire chocolate cake at three in the morning I could, and I did, many times! It was so easy for my want monsters to indulge in whatever they were craving. I noticed, however, I was becoming more anxious and overwhelmed by adult life. I was overwhelmed at how difficult it was to excel in anything worth doing because it required patience and dedication, which I quickly lost. I realized that my want monsters from my childhood were no longer silly and charming in adulthood; they were vicious and destructive. I decided to move to a Buddhist community when I turned twenty to understand myself better and to unplug. It was there where I slowly learned to rely less on external things to be content. I lived there for three years, and meditation and eating healthy changed my life. More importantly, I found new role models that gave me a positive sense of direction. There wasn’t one a-ha moment that turned my lifestyle around. It was a slow, deliberate process with daily training. 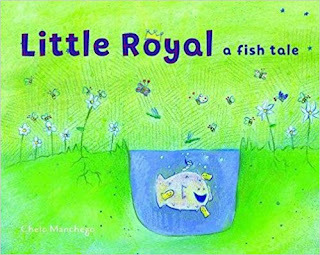 Little Royal is about “the biggest and brightest most beautiful fish in the kingdom of Me” who comes to accept that he’s actually a fairly small fish from a very small pond. In your opinion, how do mindfulness and compassion help kids (and adults) to feel self-confident without becoming arrogant? Most of us place our worth outside of us, like in the house or the car we own, our bank accounts and bodies, the social milieu we belong to, awards, prestige, etc. I think with meditation we find new ground to stand on, so we don't depend on outer circumstances to feel confident. The more we meditate, the more we shed false concepts of ourselves. I think simplicity of every kind, of material goods and mental constructions, is true power because it liberates us from attachments, even from our own ideas of what self-esteem is. Because of this freedom, one can become much more engaged in the world with a keen, strong and resilient mind. It’s the difference between the fragile leaves of a tree swaying with every passing wind and its trunk standing firmly in place. I also think – I hope – that as I meditate more I become less selfish. Compassion grows spontaneously out of this journey, I believe. Many of us only know about Los Angeles from what we’ve seen in the media, and it seems anything but moderate and compassionate: we tend to see images of the violence of street gangs or the glitz and consumerism of Hollywood and Beverly Hills. What’s it really like living in L.A.? Have you found a supportive community there? I worked in the film industry for a couple of years in the art and production department and that universe is extremely competitive. Most of the success is measured in money and fame and which celebrities you are friends with. I don’t know any! My home country, unfortunately, is an extremely violent world but in both places I’ve found gems of friends. I’ve always treasured friendship so when I meet someone interesting and kind and that I connect with, I value that very much. I also like eccentric people, which there is an abundance of in Los Angeles. The more I practice mindfulness, the more I can engage with people who are different from me, who maybe in the past I would have ignored or gotten carried away by their influence. Now I am surer of who I am and therefore more willing to listen with equanimity, whoever they are. Many Angelinos are into the things that I’m into: art, literature, film, healthy living, hiking, and meditation of course. It’s a great place to live. Did you learn about mindfulness and meditation while you were growing up? Not at all. I grew up in an ultra-catholic and conservative environment where even yoga was frowned upon and considered something pagan and wicked. I love El Salvador but it can be very close-minded to other cultures’ religions. I had such an enormous curiosity to explore the world and learn more about Buddhism and Hinduism, which I got interested in because of their beautiful representations of their deities. The closest I came to learning about mindfulness was from my track and field coach. I used to be very athletic. Sports can be an incredible way to learn about the importance of being in the moment, of having patience and repeating something over and over again even though good results take a long time to be noticeable. It means teaching from a place of compassion and thoughtfulness. They are teachings aiming to bring us back to the present moment and to not judge what’s in it. I think anything can be a mindful teaching as long as we are present for it with all of our being. I’m a big fan of Alan Watts. Many of his lectures bring up the human and fruitless habit of running away from pain by anxiously thinking of the past and the future and comparing our present situations to them. It’s easier to meditate when everything is going great and we are in a peaceful setting but our misfortunes can be our most insightful instructors if we don’t escape from them. I read a lot of spiritual and eastern religion books. Currently I’m reading the Bhagavad Gita. It’s stunning. I love being in nature; the Redwoods in Santa Cruz is one of my favorite places. I’m sure there’s a science as to why nature is so medicinal; I don’t know about it but I definitely feel its calming effects on me. What helps me the most and my work though, are probably the things I do not do. Nowadays, so many people can’t sit still for five minutes or spend an hour without their phones. I sincerely think that boredom has its benefits and should be something to embrace. Every job in the world has its dull moments to endure and if we are always swiping and changing channels these moments are going to become unbearable when we face them. I don’t have social media, I hardly watch television and (to the dismay of my friends) I don't text. I make them call! When I have free time I try not to cram my schedule with things to do but just wander around the neighborhood, play with my dog, or take a nap. I see doing nothing as increasing my threshold for sticking to one thing at a time, which is essential for illustrators and writers.